I can totally picture Steve McQueen jumping over the barbed wire fence at the end of The Great Escape on this bike. Built by a brand spanking new motorcycle shop in Costa Mesa California called RTL Moto. They specialize in vintage European bikes and describe their work as “Mad Max-style customisation“, which sounds pretty damn good to us. This is their inaugural project and I would say they hit it out of the park. The Triumph belongs to a customer named Jeremy and his brief was pretty straight forward. “He plans on doing a lot of travel next year and he asked us to build him a vintage-looking bike that he could ride off-road” says Chris Lisk from RTL Moto. 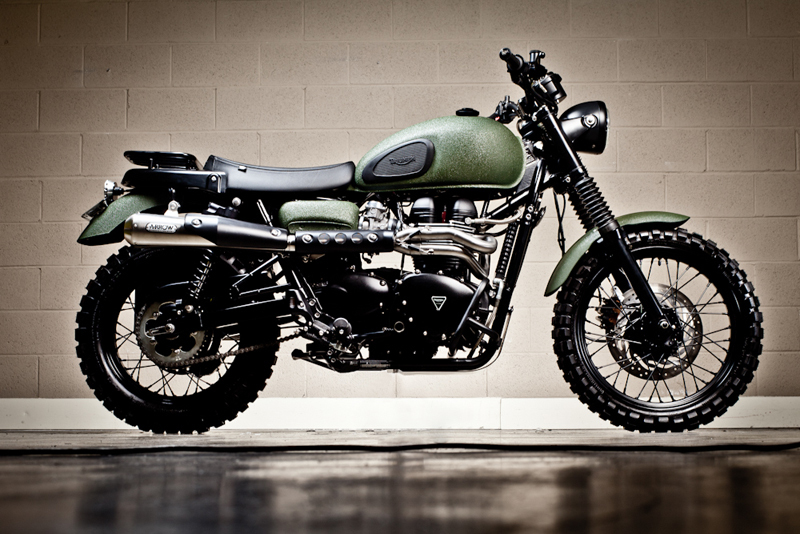 The bike is a 2010 Triumph Scrambler with a high performance and great-sounding Arrow 2 into 1 exhaust. “Jeremy really liked the look of the retro Triumph. We decided to go with the scrambler because of the wheel base.” It also has ProTaper handle bars with custom mounts, Custom 50 gallon calibre World War Two ammo box attached to the left side, Continental twinduro tires, Works Performance suspension and multiple powdercoated parts. The paint job is interesting, and it’s one we haven’t seen before. It’s painted in army green Custom Line-x wrinkle coat paint. Line-x is a spray-on polyurethane which is usually used as a protective coating in the bed lining of trucks. “I experimented with the paint a year ago on my own 2006 dyna street bob and I love it. Very low maintenance and very durable,” Chris tells us. PS. If you want to hear the bark from those Arrow 2-in-1 pipes, you can listen to them here on another Triumph.